Founded in 1999, GEMM is a young and dynamic company that operates in the professional refrigeration sector, providing high-performance equipment, designed with the utmost attention to details and cutting-edge technology. 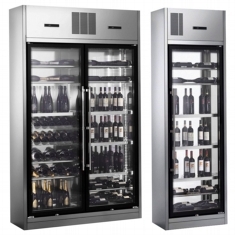 GEMM specialise in the production of refrigeration equipment designed to answer to the needs and requirements of different sectors, including restaurants, wine dedicated businesses, such as cellars, wine shops, bars. GEMM are proud to present a new line of products dedicated to wine enthusiasts: the Brera range, the result of their passion and continuous search for perfection.